Specialists in Design, Supply, Installation and Maintenance of Air Conditioning, Refrigeration and Ventilation. 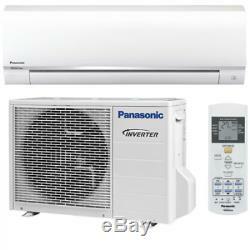 Panasonic Air Conditioning, 6.8KW Wall Mounted Heat Pump System KIT-RE24-RKE. This is a brand new system to include an outdoor condenser, indoor wall mount and infrared remote control. This competitively priced system offers. Outstanding energy ranking of A++/A+ - Unique in the market! Low energy consumption in heating and cooling. Includes Indoor unit, outdoor unit and remote control. Power supply Single phase 230V, 50Hz power to outdoor unit. Panasonic Inverter air conditioners have the flexibility to vary the rotation speed of the compressor. This allows it to use less energy to maintain the set temperature while also being able to cool the room quicker at start up. Panasonic Inverter air conditioners are designed to give you exceptional energy savings and performance. At the start up of an air conditioners operation, a boost in power is required to reach the set temperature, after the set temperature is reached, less power is required to maintain it. Bedroom up to 68 Square Metres. Small office up to 55 Square Metres. Conservatory up to 30 Square Metres. These systems should be installed by an F-GAS registered engineer. We can offer a full range of Air Conditioning supply and installation options from small capacity split systems suitable for home and small businesses up to large VRV/VRF multi systems suitable for a large variety of applications. Payments must be made in full before any products are dispatched. The items will be delivered kerbside on a wagon with a tail lift and pallet truck. The item "Panasonic Air Conditioning, 6.8KW Wall Mounted Heat Pump System KIT-RE24-RKE" is in sale since Thursday, February 08, 2018. This item is in the category "Home, Furniture & DIY\Heating, Cooling & Air\Air Conditioning". The seller is "temperatureenergylt0" and is located in Sharnford. This item can be shipped to United Kingdom.